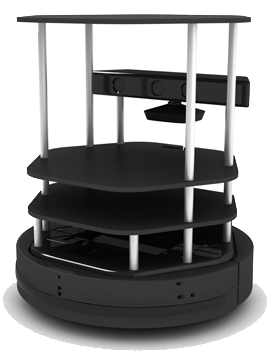 When you purchase a new Turtlebot, you would like to make sure that its sensors and actuators work as expected and behave normally. In this tutorial, we provide you a few steps to follow to test the functionalities of your Turtlebot. This command will start the Kobuki base of the Turtlebot. You should hear a sound when it is turned on. For more details about Turtlebot bring up refer to Turtlebot Bringup in ROS Wiki. This means that all bumpers are released (not pressed). The variable state can take the values 0 (RELEASED) and 1 (PRESSED). The variable bumper takes the values 0 (LEFT), 1 (CENTER), and 2 (RIGHT). Repeat the process for the left and right bumper sensor to make sure that their correct operation. This means that all cliff sensors detect a normal ground (no cliff). The variable state can take the values 0 (FLOOR) and 1 (CLIFF). The variable sensor takes the values 0 (LEFT), 1 (CENTER), and 2 (RIGHT). Which means that all sensor detected a cliff as the robot is away from the ground. Put the robot back on the ground and all states should come back to 0.